Executive Mosaic’s GovCon Index returned above the 80-point barrier Monday on strong gains by Boeing (NYSE: BA) and services-oriented companies as energy shares led U.S. stocks higher in conjunction with a rise in crude oil prices. 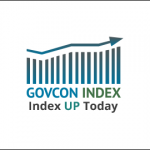 GovCon Index gainers outnumbered laggers at a 6-to-1 ratio but five of its 11 S&P 500 components rose with Boeing the top net performer in both the GCI overall and for co-listed stocks. Services contractors Maximus (NYSE: MMS), Science Applications International Corp. (NYSE: SAIC) and CACI International (NYSE: CACI) helped lift the GCI along with Northrop Grumman (NYSE: NOC). Huntington Ingalls Industries (NYSE: HII) and Rockwell Collins (NYSE: COL) both posted gains of at least $1.00 to join the GCI’s top five net performers listed above as advancers by at least one full point. Honeywell International (NYSE: HON) ended fifth-lowest on both net and percentage as the stock posted a second consecutive session with high volatility since the conglomerate on Friday issued revised third quarter earnings guidance below Wall Street forecasts. Shares in Honeywell are down 7.62 percent over two days and the stock traded at a Monday volume three-fold over the three-month average at 8.38 million shares. All of the GCI’s five worst net performers are S&P 500-listed companies with General Dynamics (NYSE: GD) also a decliner. Energy shares led nine out of 11 S&P 500 sectors higher as crude futures in New York settled up 3.1 percent to $51.35 per barrel after Russian President Vladmir Putin said it was ready to join OPEC countries in an output cut, according to Reuters.